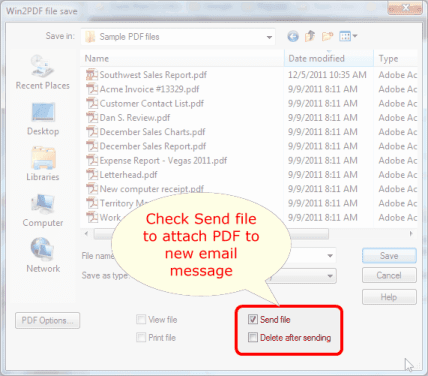 How to email a PDF file after creating it? To email the PDF file after creating it, just select the 'Send file' option on the Win2PDF file save window. When you save the PDF file, the file will automatically be attached as a new PDF file to your default MAPI e-mail client (e.g. Microsoft Outlook). You can then address the e-mail and send it as a file attachment. If the 'Delete after sending' option is checked, the PDF file will be deleted from your hard disk after the e-mail has been sent.